THE temple of Arunachaleswara is 1480 feet long and 680 feet broad  the compound wall is said to have been built by a Vellala king (also known as Bhallala king or Bhalla king). The eastern tower is 216 feet tall and has eleven storeys. One could go and sit there. This tower is said to have been constructed by Praudda Deva Rayar. As we enter from the east in the first perimeter we see a hall, in the southeast a flower garden and to the north a thousand pillared hall. 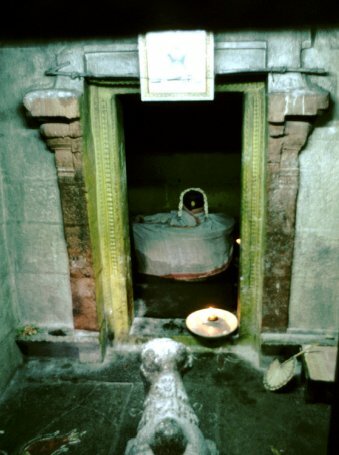 To the southwest is an underground cellar where there is a linga of Easwara. But at the time of our story no poojas were performed here and the place was utterly dark, damp and unkempt. But as it had been the place of tapas [?] for Ramana, in 1949 a devotee, Taleyarkhan, got the place cleaned, repaired and electrified. Here, a picture of Sri Bhagavan is placed and poojas offered regularly. To the west of the thousand pillared hall is the hall of vehicles and behind it is a flower garden which for some inexplicable reason is called `Vazhaithotam' (plantain garden). one  a name of Subrahmanya Swami. "Pillayar" means Vighneswara. There is a legend about "Kambathilayanar." Praudda Deva Raya was the emperor of the Vijayanagara empire around 1450 AD. 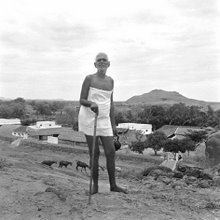 He was an admirer of the poet Arunagirinathar of Arunachala. This was unbearable to the poet Sambanda Andan. Not being able to bear the adulation showered on Arunagirinathar he challenged the king that if the poet was really all that great he should be able to present before the king, his favourite deity Subrahmanya. The king, desirous of having a glimpse of the Deity, pleaded with the poet accordingly. The poet told him: "These eyes, used as they are to seeing the physical world would not be able to stand a vision of the Lord. Anyway, I shall find out from Him and let you know." He prayed to Subrahmanya who told him, "If the king beholds me he will become blind. Let him think over this and decide." The poet conveyed that to the king. "Let me become blind. I must see the Lord," he insisted. Arunagirinathar invited the Lord who appeared in the pillar. The king had His darshan. As the Lord became visible in a pillar (kambam) he is known as "Kambathilayanar". To the west of the Sivaganga, along the pathway for circumambulation, there are huge trees (ippa trees). At the base of one of the trees a platform was put up. As we enter the second compound, we first notice the tower. This was constructed by Ballala. To the north of the tower is the Subrahmanya shrine. He is known as "Gopura Subrahmanya Swami." There is a legend about Gopura Subrahmanya. Muthu, a devadasi, lived at Arunachala with her daughter and son. The boy was Arunagirinathar. While he was quite young the mother passed away leaving him in his sister's care. She asked her daughter to fulfil every wish of the boy. As a young man, Arunagirinathar became a libertine not heeding his sister's advice. He frittered away not only the money left behind for him by his mother but even that of his sister. Yet he did not give up and still demanded money. The sister replied, "I no longer have any money but mother has asked me to fulfil all your wishes. Your only wish is to enjoy women. I am prepared to fulfil that wish of yours. What if our mother is one and the same, our fathers were different persons. Hence there is nothing wrong," saying this, she touched him. With this Arunagirinathar realized the enormity of his degradation and in a fit of penitence climbed up the Ballala tower and jumped down to end his life. Lord Subrahmanya held him midway in his arms, gave him a rosary and initiated him into a mantra. This is the legend. With this we may end the story of Arunachaleswara temple. For those desiring to meditate in solitude and wanting to be inward-minded and absorbed in the Self there are any number of solitary spots  the temple towers, the flower gardens, and the thousand pillared hall. These were frequently used but nobody visited the southern side of "Sivaganga" during night.